It’s a tricky business encountering a full-length work after familiarity with a more condensed version of it. William Forsythe’s Artifact, currently at Sadler’s for a short run, is the original full-length version from 1984. Although much lauded and referenced as a key work with a profound influence on the direction choreography was to take, in this form it hasn’t been presented in the UK since the Edinburgh Festival in the late 90s and Sadler’s in 2001. More familiar is Artifact Suite, memorably presented here at Sadler’s by Scottish Ballet a few years ago. If you are of the view that many longer dance works contain a shorter, better one within them, then you might wonder what the longer version has to offer over the pungent clarity of the pure dance ritual of Artifact Suite. It offers a frame and a context in which the massed dances of the corps are presented and ultimately more of a commentary on the ballet itself, without weakening the impact of its blazingly energetic and vibrant dance passages. However, this is not without its irritating moments and its longeurs. It is not Forsythe’s aim to give the audience an easy or comfortable time. He brings down the curtain at arbitrary moments: see, this could vanish at any moment if I choose to take it away. His subject is the dance itself, how it is constructed. The stage is stripped back: the costumes are minimalist, the lighting the only decoration. Compared to the Suite, Artifact gives us additional named characters and a good deal of spoken text. There are three named characters in the work: “Character in Historical Costume” , an older woman in an elegant grey and silver 18th century costume, “Character with Megaphone” , a grey haired man in modern dress and “the other person” , a silent grey-clad, grey-faced woman who might be some ancient priestess conducting a rite, the ghost of a ballet-mistress or both of these. The text is mainly spoken by the “Historical Costume” woman with occasional responses or interjections from the man. They consist of persistent riffs on the theme Inside / outside, forget / remember, see / think, rocks / sand / dust. Injunctions to remember not to forget pour forth as the grey figure leads the massed groups of the women through repeated simple steps as the dancers memorise their moves. The effect Forsythe seems to be trying for here is a Samuel Beckett-style dialogue of two rickety old codgers mashed up with a robotic ballet class. But the dialogue is not in that class: he is a much better choreographer and designer than he is a writer, and the text can grate. Nevertheless this scene gives us a context, reminding us of the preparation, learning and effort required before the dancers take over the space for Part 2, a commentary on the art of assembling the work. Part 2 is set to a recording of Bach Chaconne in D minor for violin. The corps line the stage in three sides of a square: this is invaded periodically by two couples performing their own, individual pas de deux at the same time, a deliberate departure from convention as you are asked to decide which pair you want to watch. (Aki Saito with Win Vanlessen, Yurie Matsuura with David Jonathan: they don’t make choosing easy). In 1984 Fosythe’s vocabulary was much more strongly rooted in ballet: though it is spikily aggressive and legs are flung upwards over beyond the perpendicular, it is not as twisted and distorted as it later became. It is cool, rigorous, fiercely disciplined and blazing with adrenalin. The grey ghost figure transmits its enigmatic semaphore signals to the corps: from very simple basic arm positions more complex patterning is assembled in front of your eyes. 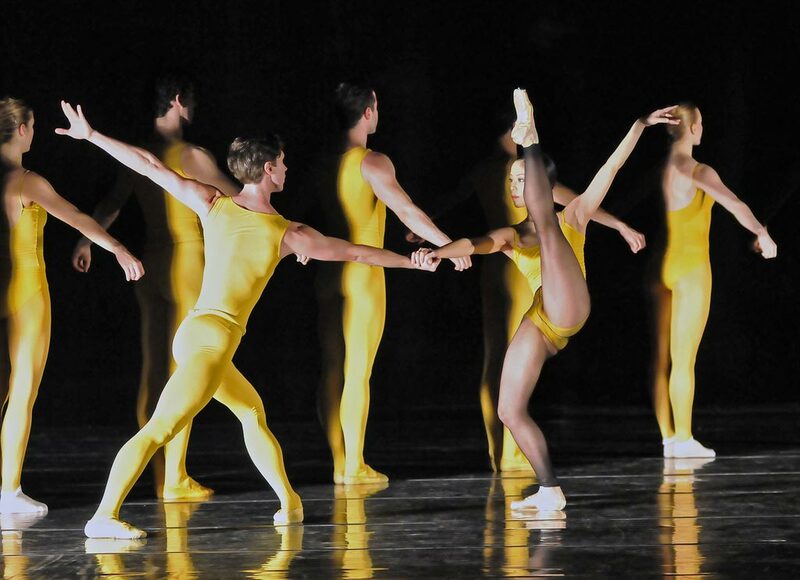 The movement even now (more than twenty years after its creation) looks more modern and more groundbreaking than any of his followers or imitators, but still at this point quite definitely connected to the ballet family tree. Part 3 brings us a more chaotic scene. Having shown us the work and the method involved in putting the dance together, we now see how easily it could fall apart. Kate Strong as the Woman in Historical Costume and Nicholas Champion as the Character with Megaphone are both steeped in the work of Forsythe and so thoroughly settled in the roles that they bicker like a long-married couple in a sitcom (“You always”, “You never”). As they argue rudimentary elements of scenery get kicked over. It’s the most irritating part of the work – probably deliberately so, a warning of how easily what’s constructed can be dismembered. Part 4 returns us to a more ordered universe with massed ranks of the corps in neat lines assembled for a coolly classical finale. Few modern works in ballet use this number of dancers (16 women, 12 men) so effectively. The success of the work is down to the rigour and precision of the dancers of the Royal Ballet of Flanders. They have a highly unified look and style, though the names in the programme suggest a wide range of nationalities (and possibly training, though the programme offers no dancer photos or biographical detail). One can only assume that this has been achieved by the Artistic Director, Kathryn Bennetts, a long-time associate of Forsythe. Her productions of his works have been acclaimed internationally. After the Sadler’s run, the production moves on to Birmingham. But sadly that is where the curtain really does come down for good. Bennetts is leaving as AD after seven years as deep budget cuts mean that the Ballet is subsumed under the management of the opera. These are bleak times for many publicly-funded companies in Europe. Forsythe has departed some time since from Ballet Frankfurt where he created the work and now operates his own smaller-scale company. No other company stages this and there is no obvious heir to stage a work of this size. The dismemberment predicted in the work itself seems to have come about. The Suite however still remains in the repertoire of a number of companies.